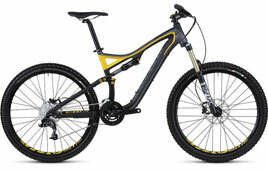 Specialized FSR mountain bike is among our fleet of Maui bike rentals. Planning a Maui bicycle vacation? Trying to decide which bike to rent for a Maui bike ride? Whether you plan to conquer the 10,000 foot climb up Haleakala or enjoy the thrills of extreme mountain biking, Maui offers every type of bicycle riding opportunity imaginable. A Haleakala bike ride, down the spine of the volcano, requires a high performance mountain bike rental such as the Specialized Stumpjumper FSR Comp. A hybrid crosstrail bike rental would be perfect to tackle the short beachside road ride followed by the single track trail to the Olowalu petroglyphs. Who wouldn't enjoy riding the west Maui loop aboard a Specialized Roubaix high performance bike rental? Watch the Specialized bike videos below to help you choose which Maui bike rental would perfect for your Maui bicycle vacation! Whatever type of Maui bicycle rental you choose, you can count on the staff at West Maui Cycles bicycle shop in Lahaina to help you match the best bike rental to your cycling vacation plans. Check out our complete Maui bike rental fleet of mountain bike rentals, road bikes and Electra cruisers! Ready to make a bike rental reservation for your biking vacation on Maui?